Click on the Connect button in the main toolbar or open the main command menu and select Connect. 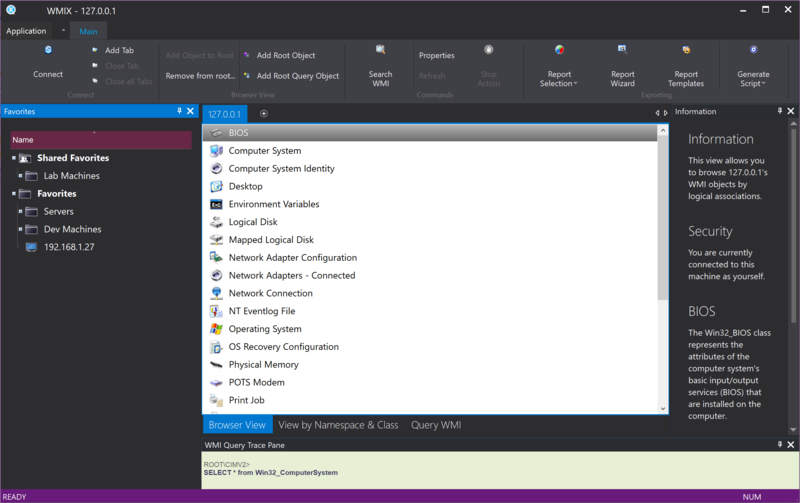 Open the main command menu and select a computer object within theRecent Connections entries. Double-click on an entry in the Favorites panel. 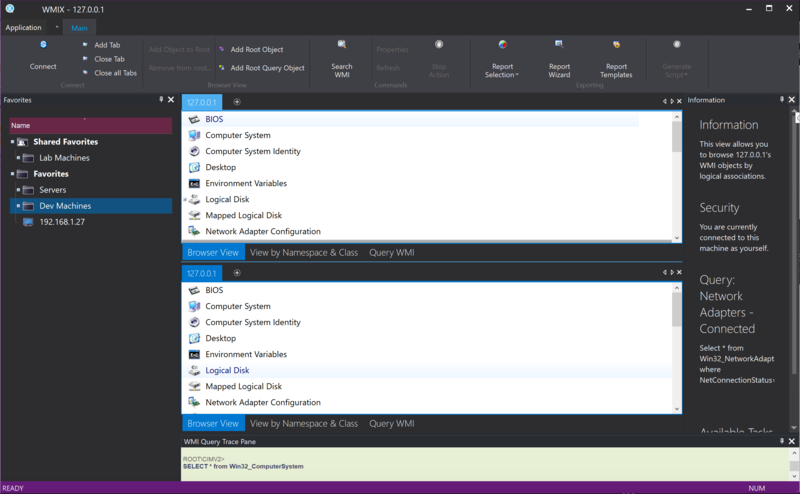 Note: The remote machine must have the WMI Management service installed and enabled for the connection to succeed. During a connection, WMIX first tests proper connectivity to the remote machine by pinging it and fails the connection if the remote machine does not answer. If the remote machine is behind a firewall which doesn’t allow pings to go through, you will need to un-check the Always test connectivity before querying a machine setting in the Network Settings category of WMIX Options. Once the connection is established, the Browser View displays the configured root object categories. Once you are connected to a machine, you can change the focus of the Browser by clicking on the Connect button in the main toolbar, or selectingBrowser >> Connect from the main menu, or by double-clicking on a new entry in the Favorites panel. The current connection is then closed and a new connection is established. Using the Favorites Panel, select an entry, right click on the mouse and select Open in new window from the context sensitive menu. Using the Connect command, check the Open in new window box before clicking on OK.
Click on the Add Tab button in the ribbon bar or right-click on an existing Browser tab and select New Browser from the context sensitive menu, then use a standard connect method. Any of these options will create a Browser window as a new tab in the main view. Each tab can be connected to a different machine. If you have multiple machine tabs opened, you can re-arrange them in your workspace according to your preference. To change the position of a tab within its group, select it and drag it right or left to the desired location. To move a tab from one group to another, select it and drag it to the desired group. If you have two or more WMI Browser tabs opened, you can choose to close them individually or all at once. To close the active browser window click on the Close Tab button in the ribbon bar. To close all the browser windows click on the Close all Tabs button in the ribbon bar.